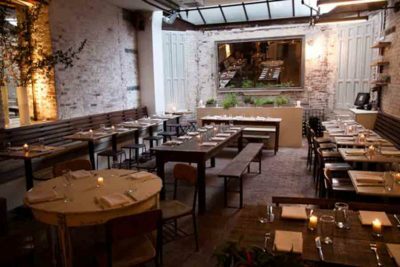 The cuisine at the Fat Radish is classified by a philosophy: simple, healthy, delicious dishes created with well-sourced, seasonal ingredients. Located on the Lower East Side, the roomy space echoes that of London’s original Covent Garden marketplace: high ceilings with large windows, skylights and plenty of natural light juxtaposed with white-washed, exposed brick walls. Dishes like the honey-glazed duck, celery root pot pie, and monkfish vindaloo are where the Radish blooms in complexity and color, and the wine list is filled with biodynamic beauties.